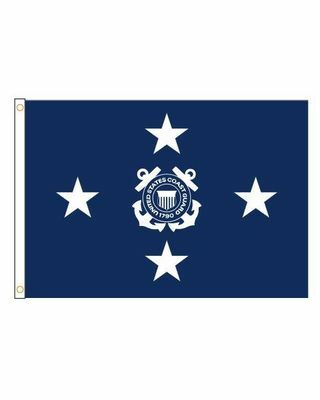 Each 4 x 6 ft. U.S. Coast Guard Admiral flag (4 stars) is printed on 100% nylon with two rows of stitching on top and bottom, four rows on the fly end and finished with a flannel lined pole sleeve. Made to U.S. Government Design Specifications in the U.S.A. This flag is currently a custom/made to order flag and may take up to a two weeks before shipping.